How much does it cost to travel to Innsbruck? How much money will you need in Innsbruck? €87 ($98) is the average daily price for traveling in Innsbruck. The average price of food for one day is €28 ($31). The average price of a hotel for a couple is €101 ($113). Additional pricing is in the table below. These average travel prices have been collected from other travelers to help you plan your own travel budget. How much money do I need for Innsbruck? Innsbruck is conveniently located near Munich, Germany and northern Italy, making it a centrally located base for seeing the Alps. Innsbruck is also a haven for winter sports and has twice hosted the Winter Olympics. The scenery is stunning and the skiing is world class. It is known as the largest ski resort in the Alps. Innsbruck was also a big contributor to the rise in snowboarding popularity during the 1990's. Snowboarding is still a huge past time in the area, and there is a very vibrant subculture of snowboarders that remains in the area. During the winter months, there are a stream of almost constant events that cater to skiers and winter sports fans, as well as adrenaline junkies. Innsbruck is also home to two different universities and a few smaller colleges, giving the city a youthful vibe with a very vibrant and enthusiastic nightlife. Innsbruck's high altitude and distance from the coast mean it has a continental climate with cold and snowy winters and warmer summers. During the summer months temperatures can reach 30 degrees Celsius and the weather is quite dry. Weather can also be unpredictable though, so temperatures may drop suddenly and unexpected rainstorms are not uncommon. Even during the summer months the night time temperature is cool and can even fall below 10 degrees Celsius. There are some great sights around town which include churches and cathedrals like the Cathedral at Saint Jacob, memorials such as Goldenes Dachl and Annasaule, and museums like the Bell Museum, Hofburg, and the Folk Art Museum. Most sights are concentrated in the Old Town area and can be reached on foot. A day or two is sufficient to see the most popular sights. Innsbrucks historic old town was established in 1180 and became a town in 1239. Most of the city's famous sights are in the Old Town area and it is a great place to spend some time exploring. Hungerburg, also called "High Innsbruck" is where you can catch the Hungerburgbahn which takes you out of the city into the mountains. The cable car goes along the north chain to Seegrube and Hafelekar. There are many activities to do in and around Innsbruck. The Tiroler Abend with the Gundolf Family is a show that lets you learn more about the traditional Tyrolean culture. There are many winter sports, and skiing or snowboarding are the most obvious activities. Restaurants and hotels around town can be somewhat expensive and the more budget options usually fill up quickly. You will find you can stretch your dollar farther if you travel to Innsbruck during the low season or in the shoulder season when their are less tourists and winter sports enthusiasts. Prices will be lower and your options will be more plentiful and available although you may miss out of the more interesting events and activities. 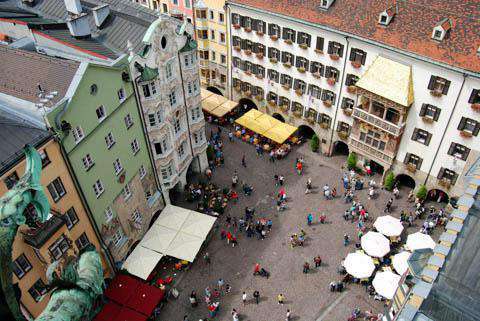 Many people spend one or two days in Innsbruck and choose to walk around the town as opposed to taking public transportation. The Old Town is easily walkable and pleasant to explore on foot. A great route to take is to start at Hauptbahnhof and head to the city center. It takes about 10 or 15 minutes. As you leave the train station, go across the street and turn to your right. Take the street on your left and follow it until you reach Maria-Theresien Strasse. Then turn right toward the city center. You'll reach a pedestrian zone and the Golden Roof. If you plan to stay in Innsbruck for a more extended period of time you would likely benefit from familiarizing yourself with the bus and tram systems. There is a bus line, TS or The Sightseer, that connects the major attractions including Schloss Ambras, Bergisel and Alpenzoo to the downtown area. This line is more expensive though and may not be the most efficient option for you. There's a tram that connects Innsbruck with the mountain village of Igls. The views are great and the landscape is beautiful. Another tram line connects Innsbruck with several villages in the Stubaital Valley. If you're burned out of skiing and want to see some of the sights around town there are some great churches and cathedrals worth checking out. The Hofkirche is home to the most significant emperor's tomb. St Jacob Cathedral is a Baroque style cathedral with interesting architecture. Wiltener Basilika is baroque style as well and built in the 1700's. Stift Wilten is a premonstratensian monastery. Schloss Ambras is a renaissance style castle with a nice grounds to walk around.